littleBits  are neat little electrical components that snap together magnetically to make electrical circuits. The littleBits electronics come collected into kits, or you can purchase the components individually. 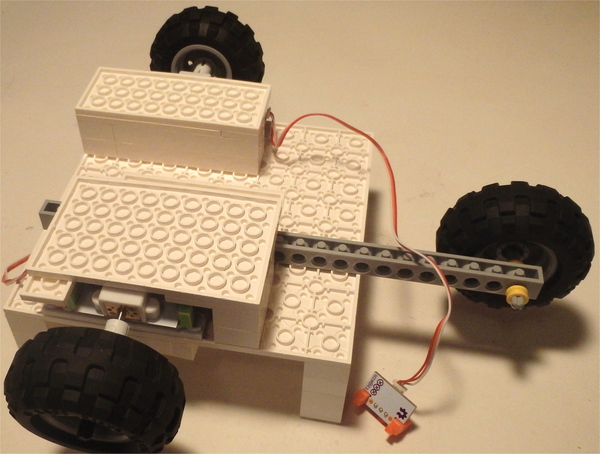 We decided to combine littleBits modules, including the Arduino module, with Lego Mindstorms building blocks and a Raspberry Pi to create a hybrid rover (see the "Rover Parts List" box). 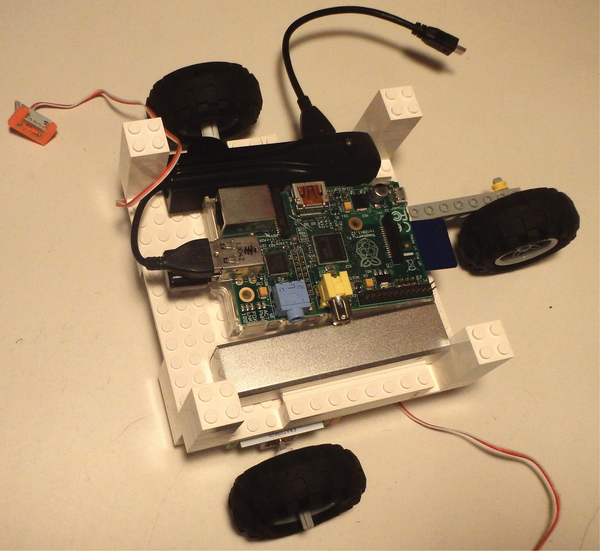 The Arduino software could be loaded on either the Rasp Pi or on a PC, but because the Rasp Pi was sandwiched inside the rover, we thought using a PC would be easier. The Arduino software is free and available for download . Then navigate to ssh and enable the option. We needed three USB connections, so we used a small USB hub. A USB network adapter was plugged directly into one of the USB ports on the Raspberry Pi. On the USB hub, we had a USB Bluetooth adapter for our Wii remote, and a short USB cable was used to communicate with the littleBits Arduino module. To power the Raspberry Pi, we used a small USB phone charger ($10 and up). 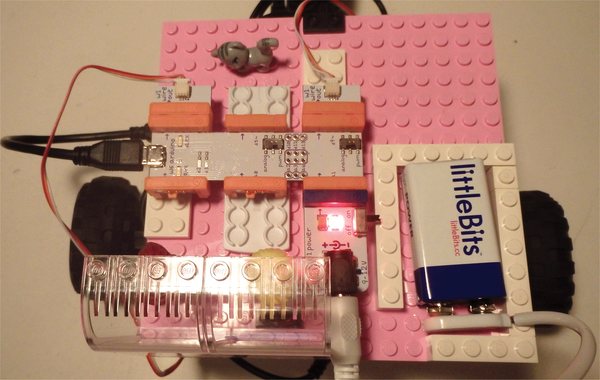 The littleBits Arduino module is powered with the 9V battery that comes with the Power module. The littleBits Power module is connected to any one of the three input connectors on the littleBits Arduino module. Building the rover with wheels and axles from a Lego Mindstorms kit was the most challenging and time-consuming part of the project. Securing the littleBits DC motors required a lot of supporting structure (Figure 1). To get the motor modules to work together, we had to set one motor to direction "left" and the other motor to direction "right" (Figure 2). Figure 1: The underside of the rover showing the housings for the littleBits motors. 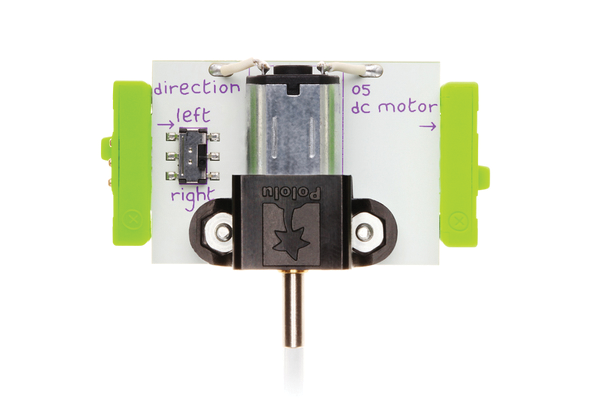 Figure 2: A switch on the littleBits DC Motor module can be set to rotate in one direction or the other (image from littlebits.cc). The base of the rover houses the Rasp Pi, a phone charger, and a USB hub (Figure 3). On the top level of the rover, we mounted the littleBits Arduino module, 9V battery, and some Lego friends (Figure 4). The switch on the Arduino should be set to "pwm" (pulse-width modulation) to control the DC motors. Figure 3: The Rasp Pi (middle) is surrounded by the USB hub (top) and a phone charger (bottom). Figure 4: Top of the rover. A 9V battery powers the Arduino board.